Good ventilation is a key component in achieving the optimum indoor environment for livestock and poultry. In warmer seasons, large volumes of fresh air are needed to supply the required oxygen and control humidity and odours. During cooler seasons, only a small quantity is necessary for oxygen supply and humidity control. Air inlets are used to distribute incoming fresh air to all areas. By mixing the incoming air with the room air before reaching the animals, the risk for an uncomfortable draft is reduced. Air temperatures above or below livestock comfort temperature range interferes with animals ability to achieve and maintain a normal body temperature and good health status. The animals body is no longer focused on production or reproduction, but achieving a regular body temperature. Rapid and frequent temperature changes can cause drafty conditions which may cause stress and respiratory health issues within the livestock. Water vapour is created mainly through animal respiration. Combined with other variables, such as evaporation from wet floors, the room will become damp quickly and will not be able to achieve a comfortable temperature range. This can be rectified by maintaining good air exchange. 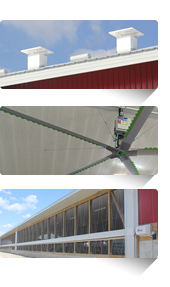 Rapid air turn around also aids in odour removal, minimizing the spread of disease organisms and decelerates barn deterioration. Animal environments accumulate carbon dioxide from respiration displacing vital oxygen. The breakdown of manure in the room also causes the production of ammonia, methane, and hydrogen sulphide which all have the ability to hurt animal productivity. These gases also cause equipment and structural deterioration as well as unpleasant conditions for workers.